After the success of its first auction, last June 16th, that totalled 2 million euros in lots sold, Faraone Casa d’Aste is ready for a new rendez-vous. The Company, part of Faraone Gioielli, whose heritage dates back to 1860, will have its “Christmas Auction” next 23rd of November 2016, at the Four Seasons Hotel, in Milan. The auctioneer Patrizia di Carrobio, a well-respected professional in the diamond and jewellery world, will lead the sale, by offering more than one-hundred high jewellery and horology lots to boutique owners, collectors, and private buyers. It is for sure a strategy of Faraone Casa d’Aste to let private buyers enter the salesroom, by letting go under the hammer, at the eve of Christmas, jewels and watches with a certain pedigree but available and accessible for those budgets devoted to gifts, with estimates starting from 1,000€. These fine objects, mainly from the XXth century, will go together with lots devoted to satisfy the most demanding dealers and collectors at a price lower compared to those applied to the same jewel in high-end boutiques. The sale will have signed jewels, of the most recognized brands, such as Buccellati, Faraone, Bulgari, Cartier and Pomellato. 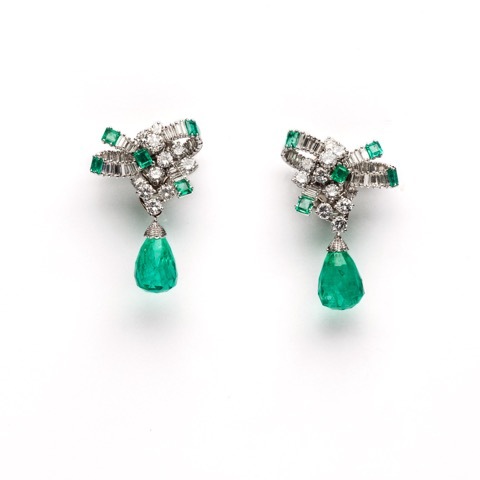 Among these, a Solitaire Ring signed Tiffany&Co, of 1.60 carats, and a pair of Platinum, Diamond and Emerald Earrings by Chantecler, with round-cut and baguette-cut diamonds and two briolette-cut Colombian emerald drops for 22 carats in total. Following with the auction’s highlights, a Silver and Old-Cut Diamond Necklace, (circa 30 carats), and a Platinum and White 18k Gold Diamond Bracelet, with round and navette-cut diamonds for circa 51 carats. Here is also a White Gold and Diamond Sautoir, signed Chantecler, in white gold 18k, with old-cut diamonds for 1.20 carats and with a natural pearl drop of 10 carats. Among the timepieces that will be offered at the auction, an extremely rare Rolex Chronograph Antimagnetic from the 1930s, a Patek Philippe “Tegolino” from the 1950s with platinum case and diamonds, and a vintage Cartier Tank, in yellow gold 18k, with diamond pavé dial. Material courtesy of Faraone Gioielli.